I’ve been on a personal/professional development reading kick recently and I just finished reading The Score Takes Care of Itself: My Philosophy of Leadership. 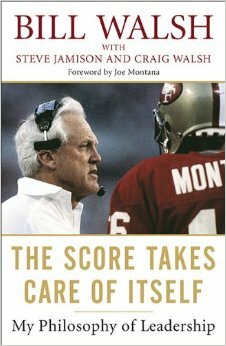 Co-written by Bill Walsh and Steven Jamison, it’s an interesting combination of football field-meets-boardroom. I also had no idea that in the early years of the game, it was against the rules to pass the ball. How did I not know that? I also found out that Ronnie Lott opted to have part of his pinky finger amputated than have a bone graft done so that he would be able to play at the start of the next season.1 What? Seriously, what?? A testament to either insanity or supreme dedication, I’m not sure which. Bill’s style seemed to be on the micro-management side and a bit autocratic for me and I found the football stories and tales generally more interesting than the sometimes-tenuous connections the authors made to the business world. Use positive language and have a positive attitude; promote internal communication that is both open and substantive; always acknowledge that the success of the team belongs to everyone, not just key players. Those seem like common sense principals, but I think his ferocious determination to instill those in everyone from secretaries to grounds keepers to coaches and players is likely why the man was able to lead the San Francisco 49ers from the worst franchise in sports (all sports, not just football) to Super Bowl winners within 3 years and what helped his team go on to win 3 more Super Bowls during his 10-year tenure. I think these are sound principles that can applied to just about any endeavor. 1I consider myself a team player, but I do draw the line at amputating parts of myself for the good of the team. I’m no Ronnie Lott.